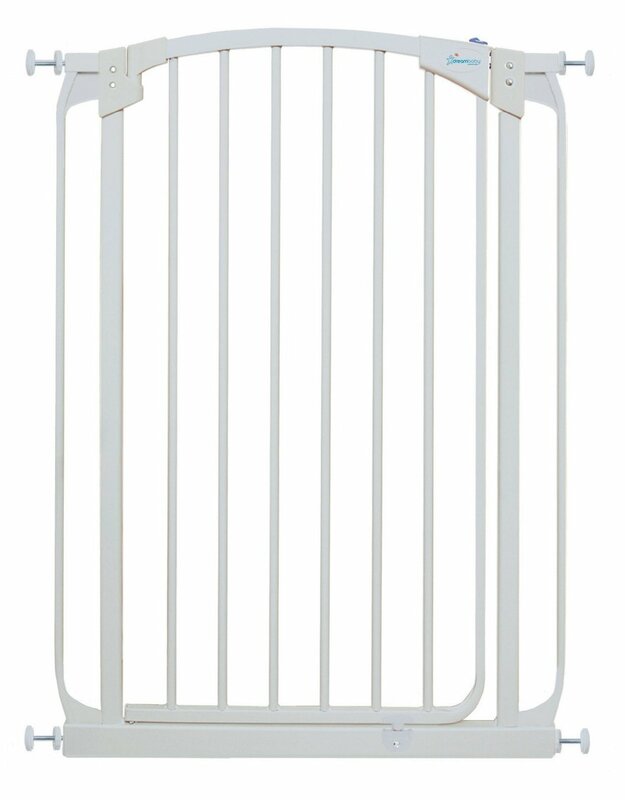 An extra tall baby gate is usually a little bit different compared to any standard design because of the extra height, though they usually serve the same purpose as the others. They will help keep your large pets such as cats and dogs out and your baby confined in a safe environment. If you have a tall energetic child, then using a standard design that is easy for the child to climb over is usually not ideal. The extra height is usually too high for your older toddler to reach, making it more difficult for your curious toddler to see over or climb over. It will also help prevent larger pets from jumping over. A gate that has a height that reaches above your waistline will serve for a long time as long as it remains too high for your child to reach it. In future, when your child no longer needs to use a barrier, you can use it to keep pets from jumping over and out of trouble. If you are tall, you need to choose a type that you don’t have to bend over in order to open. If you want the convenience when opening and operating it especially if you have a back problem and you don’t want to bend even an inch, then selecting a design with an extra height is the best option. This gate measures 41 inches in height. It features a durable steel structure with a walk through door. It fits hall openings and doorways from 29.5 inches to 34 inches wide. It comes with a 6 inch extension to allow you to increase the width up to 40 inches. The door safety lock easily operates with one-touch release. The gate is designed for children between 6 months and 36 months of age. It comes with 4 spindle rods included to facilitate pressure mounting. If you want to use it at the top of the stairs , the gate comes with 4 wall cups to facilitate its mounting to the wall. 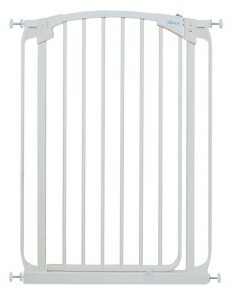 This gate is available in both black and white colors. It measures 39.4 inches in height. The walk through door opens in both directions and also swings closed automatically. You can pressure mount it or use the included mounting cups for sturdy installation at the top of stairway. It can also be used as a pet safety barrier to contain larger pets. If you need to attach it to balustrades and railings, there are adapters available here for that purpose. 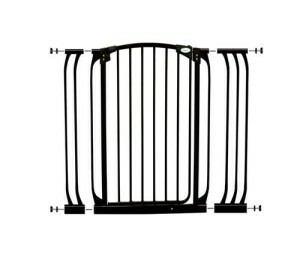 This steel gate is also available in black color. It measures 40.5 inches tall. It fits openings from 28 inches to 32 inches wide. If you want it for a wider opening optional extensions are sold separately here and here. The walk through door swings open in both ways has an easy close feature and automatically shuts close. It is pressure mounted and JPMA Certified. It can also be used as a safety gate for large pets.